Here are mine, the ones I've seen a million times and are never tiring. I included movies I love where pivotal scenes take place at Christmas time. Now, please list all of yours so I can go "Oh man, I totally left that one off!" P.S. I've never seen A Christmas Story. Every year I think: This is the year! Hopefully, this will be the actual year. loe actually isn't just my favourite christmas movie - it's my favourite movie EVER! (I love movies that have different but mildly connecting stories). hmm what else...the claymation rudolph movie of course! Julie - I'll have to watch that one! Patience - I know, right? 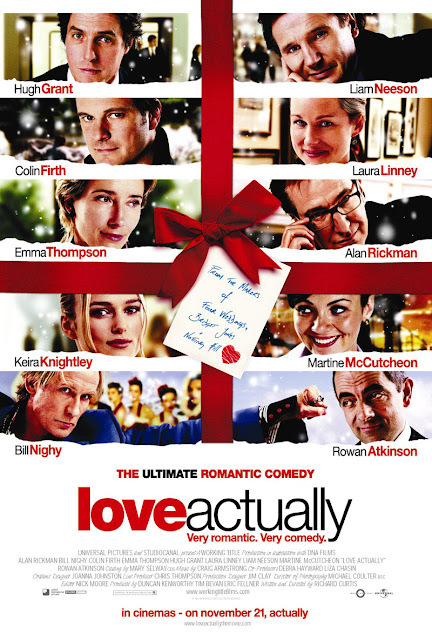 Love Actually is really the best. I always looked forward to seeing the Christmas specials on TV every year (claymation rudolph, Animated Frosty the Snowman). I love them! Mickey's Christmas Carol is a close, close runner-up after The Muppet Christmas Carol for me. I friggin love The Muppet Christmas Carol, though it makes me cry...even at the happy parts. Definitely watch A Christmas Story! I love it. What about When Harry Met Sally? I liked The Holiday as well. It should definitely be on the list!! When Harry Met Sally is a perfect addition! It's very Christmassy. Mandy - Nope, still haven't seen it. I might have to watch it post-christmas. My husband loves it, so maybe we should just buy it for our collection.